Sourcing fabrics for this was an enjoyable journey in itself. Etsy is full of delectable trims and accessorising elements that range in price from the eye watering to the very reasonable. What makes this dress special for me is the trim that is applied between the contrast fabrics. 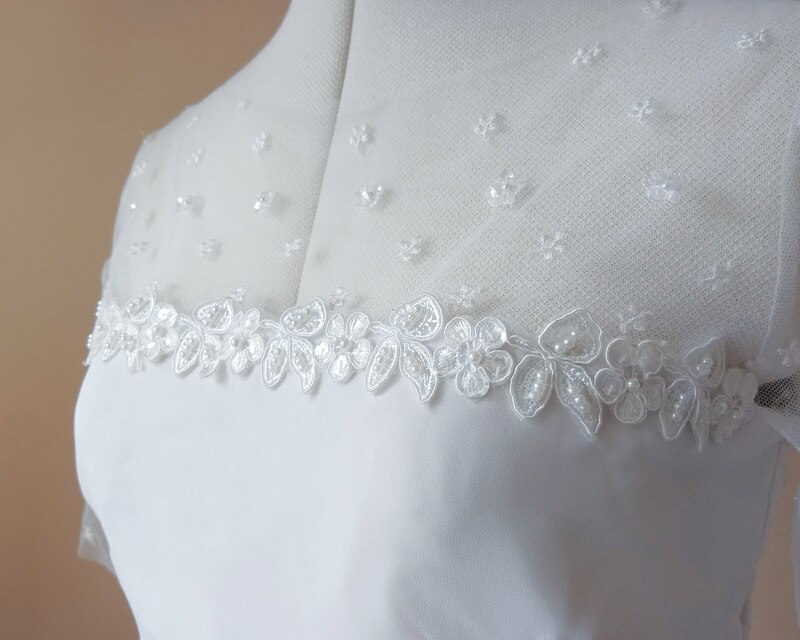 I wish I could say I remember where I got it from, but I can't...I do remember that it was at the much lower price end, and includes some beading on top of the lace which picks up beautifully as it's being worn. There really is a lot out there for occasion wear so it's definitely worth checking out if you are making something special. Most of it comes in 1 yard or 1 metre lengths - this is precisely what I used for this make and it just about fit around the circumference of the dress. The primary fabrics are sourced from Truro Fabrics, and I used 1m of each for this dress. There are three layers to the main body; ivory crepe, beige lining with ivory polyester chiffon overlay. I didn't originally intend on lining the dress but the ivory crepe was quite sheer and needed another layer and was tacked together to be sewn as 'one piece' (underlining) rather than to have three separate layers hanging free. There's a handy tutorial on Threads if you want more details about this technique. The top portion is an embellished tulle, complete with embroidered flowers, sequins and beading. It is at the lower priced end of these types of fabrics, but still costs more than the average crepe that I use. In order to sew the seams required in this fabric, I had to snip the beading and sequins off of any flowers that would appear in the seam allowance. The good news is that this fabric doesn't fray so seams can be left unfinished (yay! )...I even left the back v neck as a raw edge. This dress is based on the New Look 6261 pattern that I used for my Lace Dress (many more details about the pattern and instructions on the Lace Dress post). I really loved the fit of the main body of the dress and felt that there was mileage in hacking this pattern to a slightly different look. For this dress I used the pattern pieces for View A with a higher front neckline and sleeves. 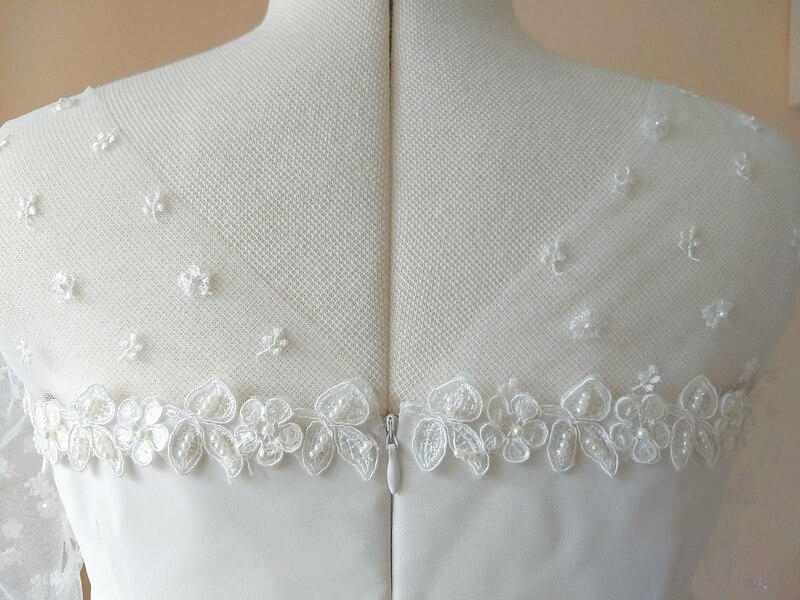 I have an existing ready to wear dress that fits very well that I then used to guide my alterations; it was shortened a lot, and the back neckline has become a v neck back. I used my other dress to gauge a point where my contrast line should be placed, marked this on the pattern, then added a 1.5cm seam allowance to both pieces. This point is also where the back V neck and zip point meet, for ease of construction. The alterations were simple ones, and the construction of this pattern is quite straightforward too so it isn't a complicated make. What does take time is the hand sewing of the trim over the top of the contrast seam line. Hand sewing is not normally my favourite part of making (I've just slipstitched a circle skirt so really not feeling it right now). That said, attaching this trim was quite a satisfying slow sew. I think that might be because there was a really obvious end to the hand sewing, instead of the 'invisible' look I'm usually trying to achieve! 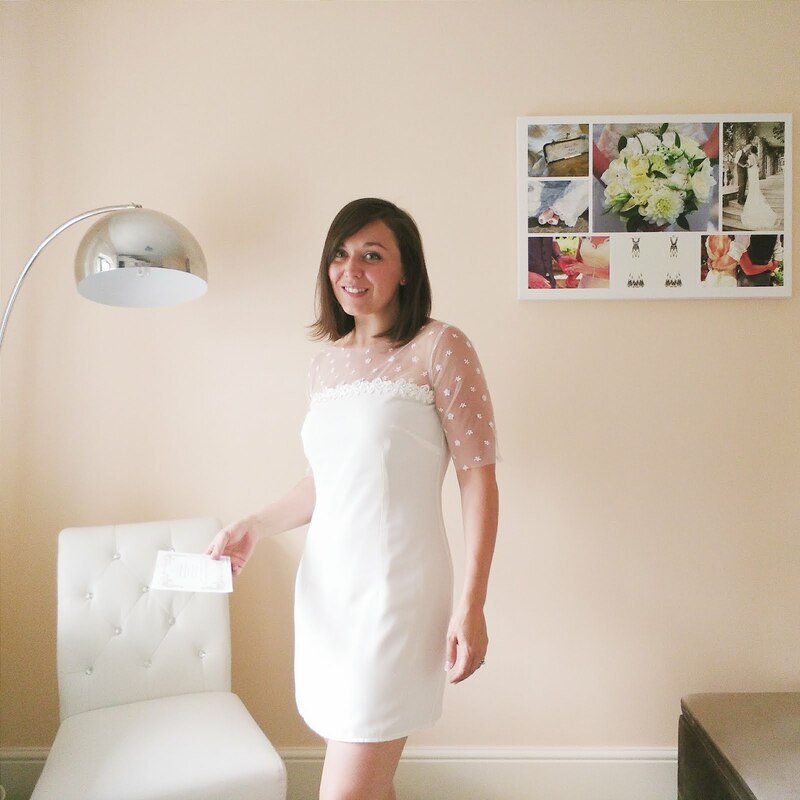 I really love this dress (even if I'm not sure about my knobbly knees in these pictures!) but it does look too bridal to wear to most of the occasions I've been too. It's also a little shorter than I originally intended which again limits where I can wear it. Suggestions on how to get this make out into the wild gratefully received!